WHAT TO CONSIDER WHEN BUYING WINTER TIRES FOR A SUV â&#x20AC;˘ Our family just purchased a beautiful ranch property in Montana I realize I needed to invest in some good quality SUV winter tires to insure my families safety while driving on snow and ice. Even though we have a 4-wheel drive vehicle with the winter conditions in Montana we needed to make sure the tires were well adapted for our SUV especially considering the additional weight of an SUV, braking distance was of concern. It is especially important to have good grip on the road as Montana can experience quite high winds, which make the driving conditions in the winter even more challenging. We just recently put the Nokian Hakkapeliitta R2 on our family car we decided to look for another Nokian tire especially made for SUV. We choose the Nokian Hakkapeliitta R2 SUV for our SUV. WHAT TO CONSIDER WHEN BUYING WINTER TIRES FOR A SUV â&#x20AC;˘ We decided to invest in dedicated winter tires because even though we have a 4-wheel drive it does not take away the need for winter tires. It might even be more important to invest in high quality tires, as the SUV is much heavier and therefore more difficult to stop especially on icy snowy roads. So dedicated winter tires are important when you live in a place like Montana with real winter road conditions. WHAT TO CONSIDER WHEN BUYING WINTER TIRES FOR A SUV â&#x20AC;˘ The Nokian Hakkapeliitta R2 SUV uses this technology of the grip claws between the tread blocks to be able to improve grip and thereby handling on snow, slush and ice. In fact this version of the tire is able to stop even quicker than its predecessor. The improved grip will also help maneuver the vehicle in high winds, something to expect in Montana. Another great feature is the lower rolling resistance, which translates into higher fuel economy. And if this wasnâ&#x20AC;&#x2122;t enough these tire benefit from the Nokian Aramid sidewall technology. A very sturdy sidewall built with aramid fibers that are exceptionally durable and puncture resistant, something that will come in very handy on our very rocky access road. WHAT TO CONSIDER WHEN BUYING WINTER TIRES FOR A SUV â&#x20AC;˘ We decided to equip both our SUV and family passenger car with dedicated winter tires as we felt the Montana winter road conditions gave us no other choice. 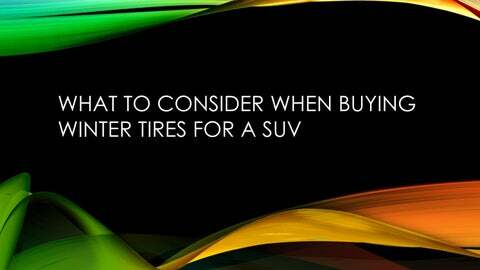 Once spring comes around we will need to make the decision to either buy all-season tires or all-weather tires. I realize that itâ&#x20AC;&#x2122;s not necessary for everyone to purchase dedicated winter tires. However for my family we felt it was the safest choice without compromising performance.